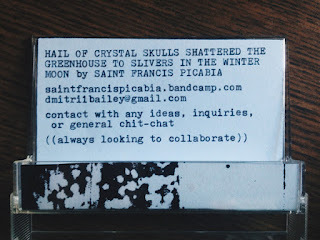 Cassette Gods: SAINT FRANCIS PICABIA "Hail of Crystal Skulls Shattered the Greenhouse to Slivers in the Winter Moon"
"Hail of Crystal Skulls Shattered the Greenhouse to Slivers in the Winter Moon"
I feel honored to be the one who was allowed to review this tape. 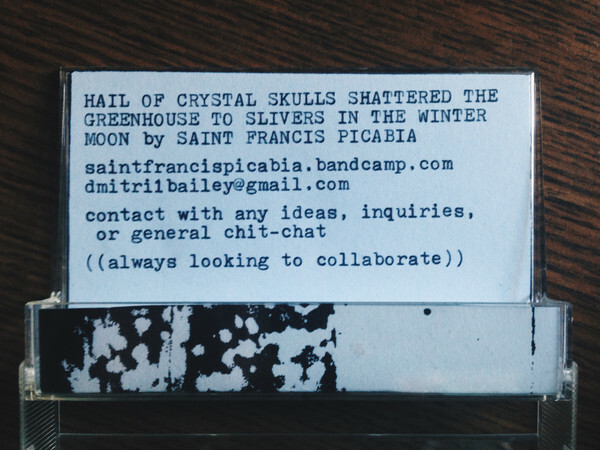 Hail of crystal skulls is immediately enjoyable with its haunting textures complete with muffled spoken word in the introduction. SFP suggests narrative-less pieces in the bandcamp notes but i disregard his wishes and imagine a mass gathered to prepare for the reckoning. 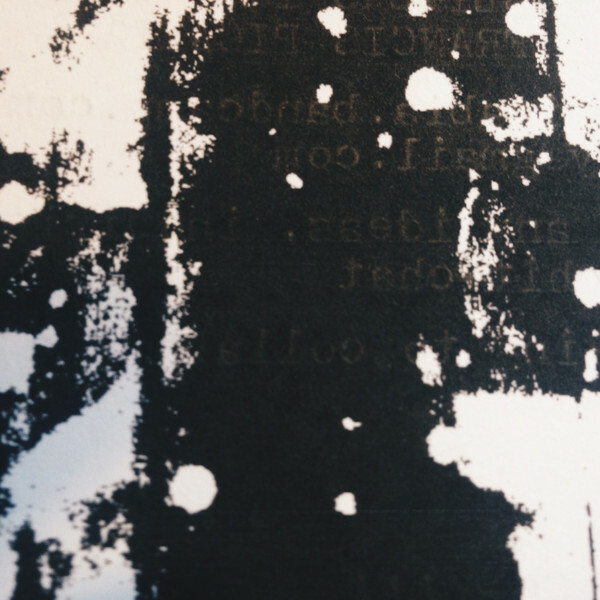 Throughout the tape we are served with choral movements, pulsating low end synth, siren swirled synth, atmospheric found sound, manipulated samples and overtly darkened, gloomy frameworks. SFP continues to add dynamics throughout with reversed guitar lines, arpeggiated keys, harshs noise and... parlor jazz samples. None of it sounds out of place and flows perfectly. Again, i mentioned i was honored to review this because it is now one of my favorite albums and i have a new artist to follow closely that resides near me in Ohio. It's exciting! Saint Francis Picabia has since changed the project name to Margot Plague but the enticing sounds still remain in full effect.